left is Wayne ZL2WG; middle is Lee ZL2AL (SK 2015); right is John ZL1BYZ. 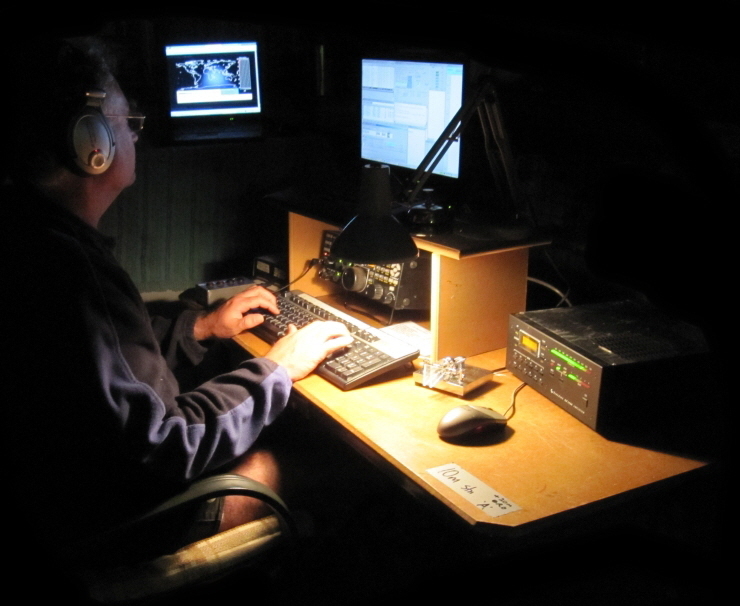 Below, John ZL1BYZ is in the zone, working a 10m CW contest pileup in the dead of night at ZM4T. 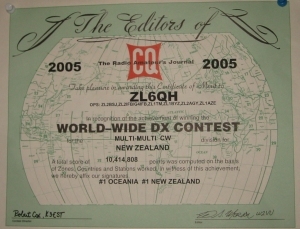 This is the ZL6QH team that won the multi-multi section of Oceania DX CW contest in 2006. Well OK, to be fair, we were the only entrants in that section but still we’re quite proud of our score. 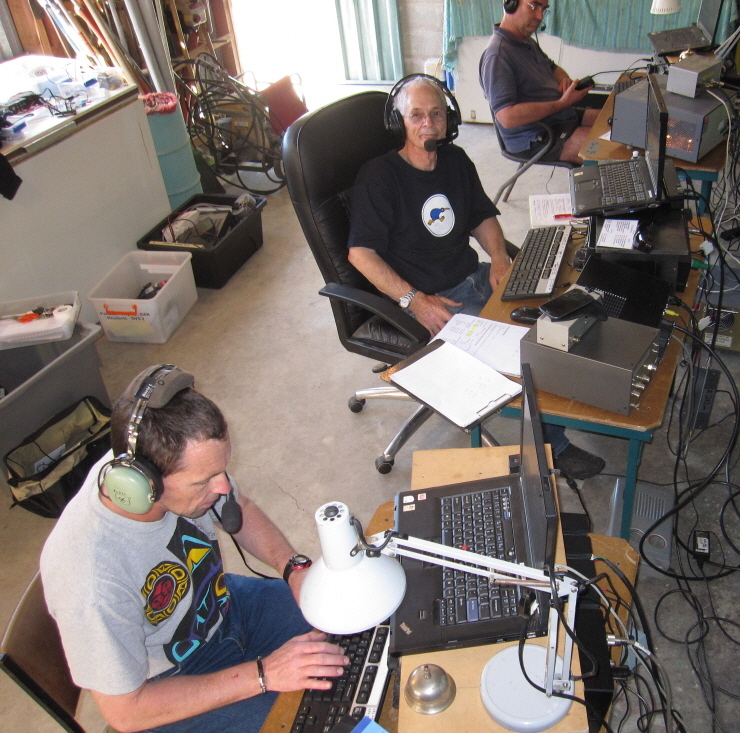 From left to right this is Brian ZL1AZE (top dog at Quartz Hill, now VK3IA), John ZL1BYZ, Wilbert ZL2BSJ (now PE7T) and me (the lardy one sporting a VI9NI teeshirt). The ZL6QH site is now a wind farm and ZL6QH is no more. <- A typical view of one of my friends at ZL6QH super-station near Wellington. 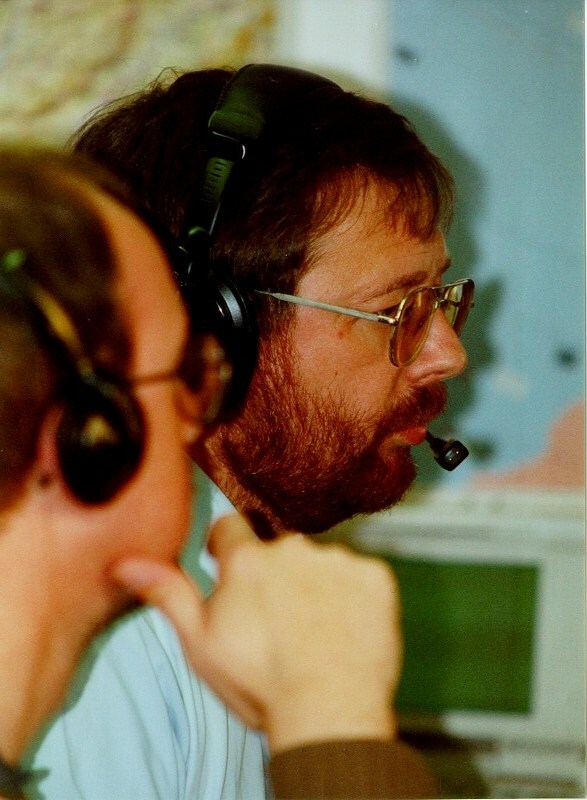 It’s Brian, ZL1AZE, who (along with Wilfred ZL2BSJ - see above) did most of the antenna work at QH in all weathers. It is almost always blowing a gale with chilly horizontal rain that hurts your face, ideal in fact for the wind farm. The certificate below was for our multi-multi entry in CQ WW CW in 2005, winning first place in Oceania. 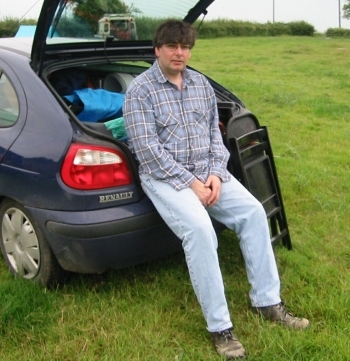 Here is Phil G0HSS, now VK4BAA. 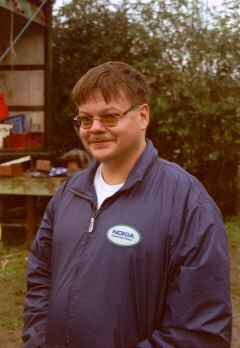 Phil was chief VHF/UHF linear builder for the Windmill Contest Group, helping us win many a VHF FD in the UK. Phil writes a contest column in VK and is still very active. 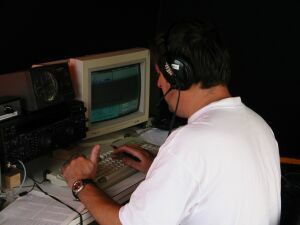 We went to Norfolk Island together in 2006 with Bill VK4FW and other VK hams, operating as VI9NI during the island’s centennial celebrations. Phil popped over to ZL to join me in CQ WW CW 2007, and I nipped over the ditch to join Phil & krew at VK4KW for CQ WW CW 2014. This fine bunch of men is the Windmill Contest Group, winners of many RSGB field day contests. 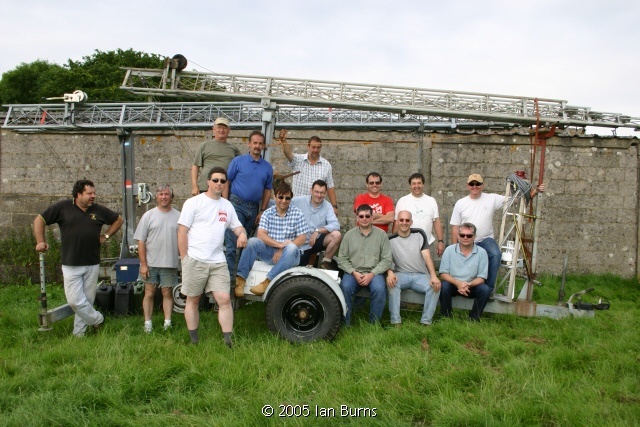 The team picture was taken by Ian G0AFH at the end of VHF FD 2005 near Ashford in Kent. Phil G0HSS (sitting just to the right of the tyre) flew back from Australia especially to beat G5LK/P ... looks like they pipped us by 6 measly points! Having slaved for weeks in his garage, this was the moment Chris showed us his new “50th anniversary” microwave transmitter, ready just in time for VHF field day. 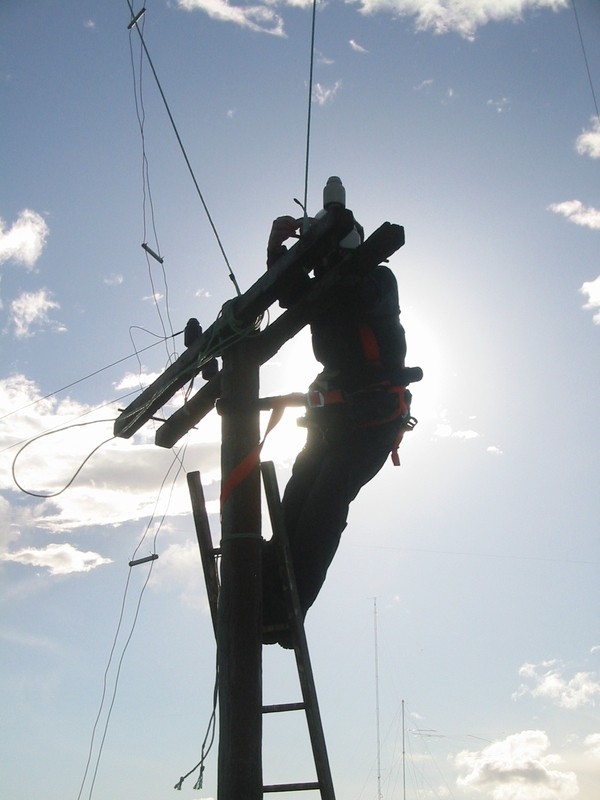 We often rely on Chris’ amazing skills to keep us going. We were particularly impressed with the quality of the internal engineering in this case, as viewed through the glass panel on the side of the resonant cavity. Dave, G4BUO, has been my friend for decades, literally. We’ve done countless contests together, and won quite a few - truth is, Dave is a highly accomplished operator, I just filled-in the gaps in the schedule. These fit young men are Bob G4BAH (SK in 2017) and Darren G0WCW, stalwarts of M6T. I took this picture during CQ WW one year - prior to the contest, we had to return to the Martlesham club site to get some equipment, only to find the clubs mast swaying wildly in the brewing storm. Whilst Darren went desperately looking for a sledgehammer and I took more photos for posterity (! 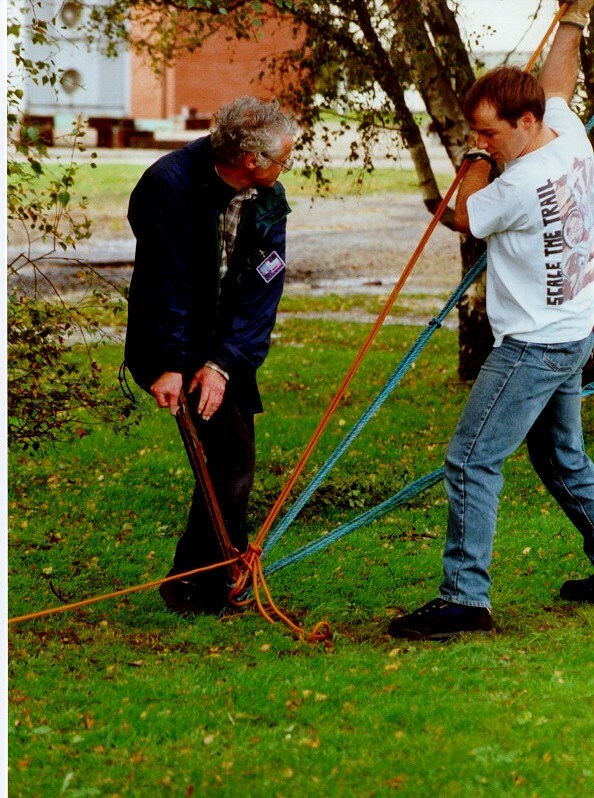 ), Bob’s sleight weight was the only thing holding the stake down and the tower up.